1. 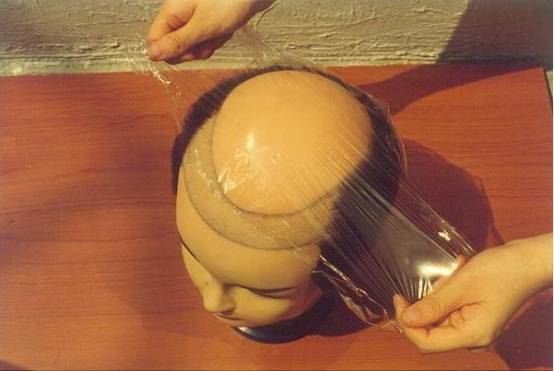 Place an 18-inch square of clear plastic wrap so that it covers the top portion of the head. 2. 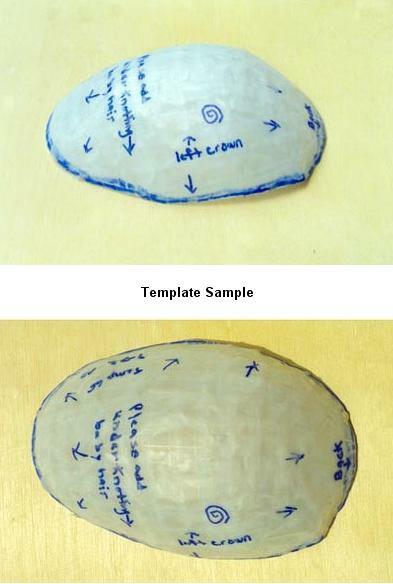 After pressing the wrap close to the head, use tape to contour the head shape. 3. 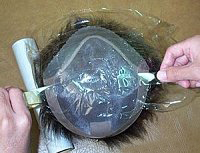 Beginning at the forehead, place transparent tape perimeters of the pattern. 4. 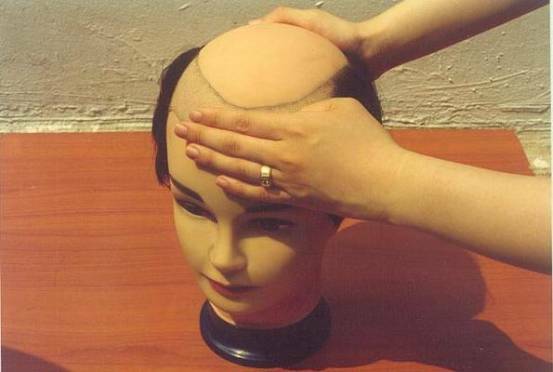 The areas of baldness determine these outer perimeters. 5. 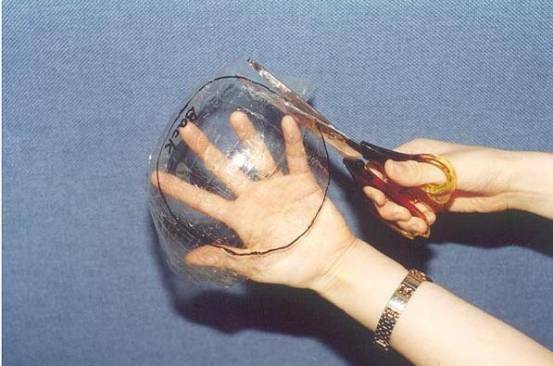 After you have taped the boundaries, cover the inner portion of the plastic wrap with overlapping piece of tape. 6. Apply 3 layers of tape. 7. 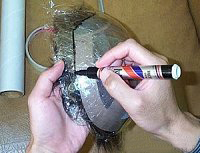 The tape will lock the plastic wrap into a permanent transparent tape template. 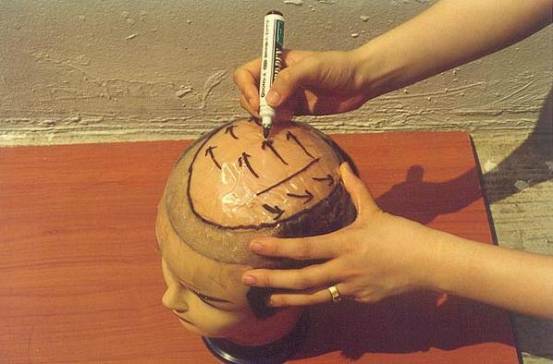 Mans Hair System: Using a Sharpie permanent marker, draw pattern lines on the tape template while it is still on your head. Though requirements vary from person to person, some rules of thumb apply to most. Front hair line should usually be established by placing 3 or 4 of your fingers(depending of your age) about the brow line. Lines are drawn from that point to form a pattern, which covers the bald area. Deeper recessions look most natural. 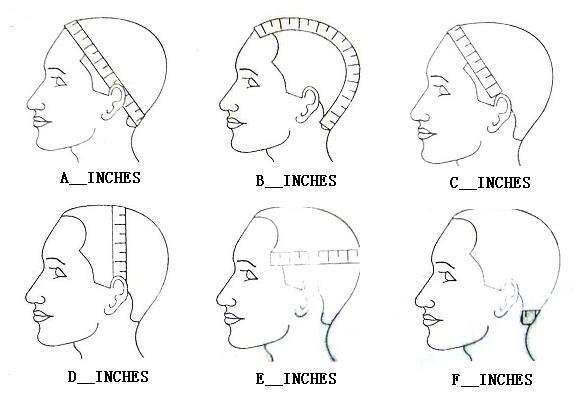 Womens Hair System : Side measurement is done like men's above. However, front to back is different. Because women typically thin in front but don't recede like men do, it is wise to use the natural bang and add hair behind it. (Some men may choose to do this technique also). Start your measurement about 1 inch behind natural front hair line, going over the top to back as far as it needs to cover the thin area. After the entire outer perimeter of the pattern is drawn, the desired style should be indicated. If a part is desired, draw a line from a pivot point at back crown to the front hair line. Placement of the pivot point should correspond to what can be seen of your original growth. 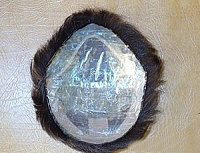 Indicate the probable growth pattern on the tape template, the date the tape template is made, as well as other pertinent information concerning your hair piece. After you have finished marking the tape template, add one more layer of tape (now 4) to cover and seal in the markings. Since the average life of a hair system is 12 to 18 months, good record keeping is advisable to keep the hair piece current. 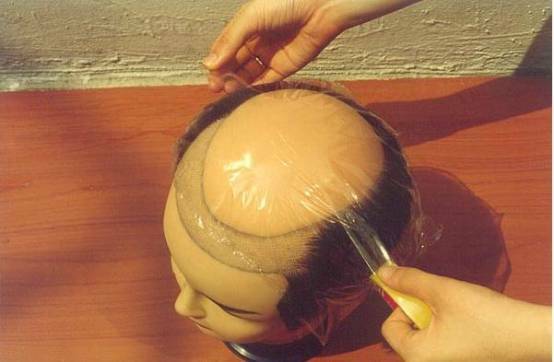 Remove the tape template from your head and trim the excess plastic wrap off. 2. 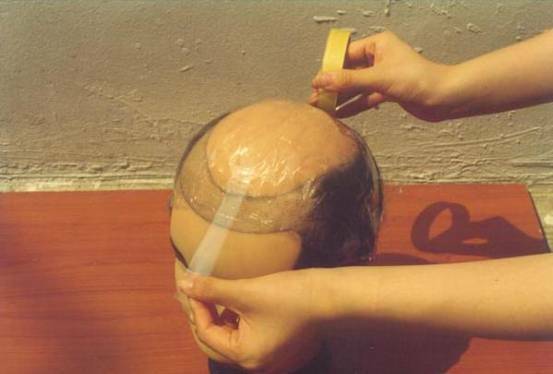 After pressing the wrap close to the hair system, use tape to contour the hair system shape. 4. 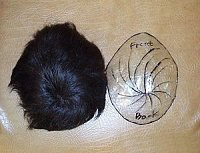 Lines are drawn from that point to form a pattern, which covers the hair system area. 5. After the entire outer perimeter of the pattern is drawn, the desired style should be indicated. If a part is desired, draw a line from a pivot point at back crown to the front hair line. Placement of the pivot point should correspond to what can be seen of your original growth.